Animal Wildlife | Leopard Seal | The leopard seal is the second largest species of seal in the world (behind the elephant seal) with some female leopard seals growing to 3.5 m in length!The bull leopard seal (male leopard seal) is generally smaller than the female leopard seal with large males growing to around 3m.The leopard seal is native to the frozen waters of the Antarctic but is also found to the north in the warmer climates.Leopard seals are often seen near South America,South Africa,New Zealand and around the south coast of Australia often in the warmer waters that are on close proximity of the frozen seas which the leopard seal thrives. 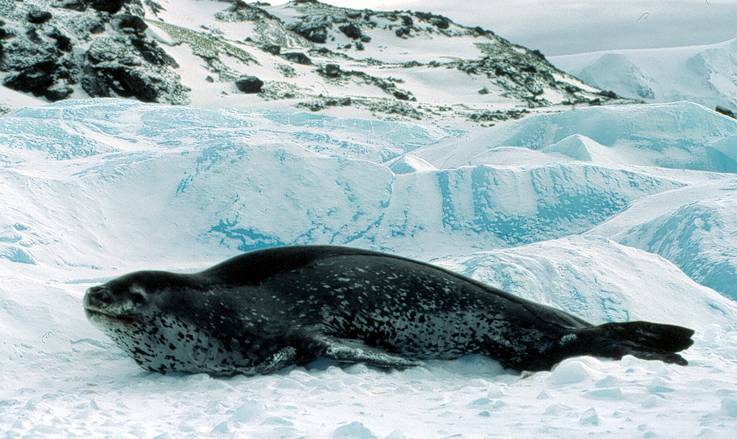 The leopard seal is a dominant predator in its environment and is rarely preyed upon by other animals with the exception of human hunters, the occasional desperate shark or killer whale . 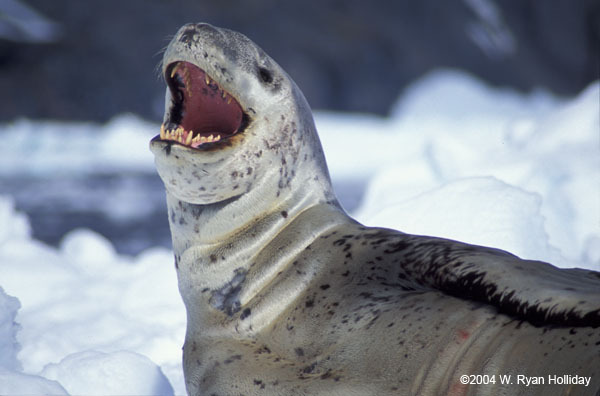 The leopard seal eats krill and plankton in the water but the leopard seals prefer to hunt larger fish and squid. 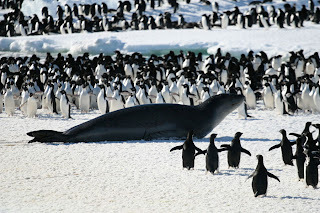 Leopard seals have also been known to occasionally hunt even larger animals such as penguins. Leopard seal can live for more than 25 years, with this often depending on the size of the leopard seal and the skills of the leopard seal, as far as hunting goes. 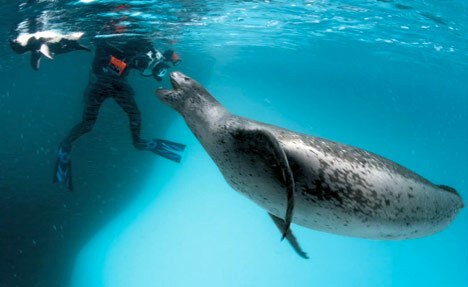 Leopard seals are extremely dominant and aggressive predators in their environment. 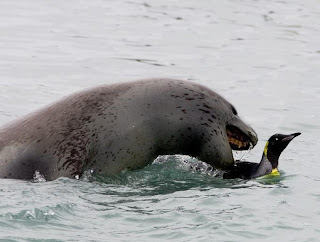 Like other species of seal , theb uses its hind limbs in order to push the leopard seal through the water. Leopard seals have also developed strong front limbs that help the leopard seal to be more agile in the water. The way in which the leopard seal uses its front limbs in conjunction with its hind limbs, is very similar to the way in which seal lions move about. The Leopard Seal is a solitary animal with the leopard seals only coming together in small groups when it is time to mate. The female leopard seal digs herself a hole in the ice and the leopard seal pup is born after a gestation period of about 9 months, during the Antarctic summer time. 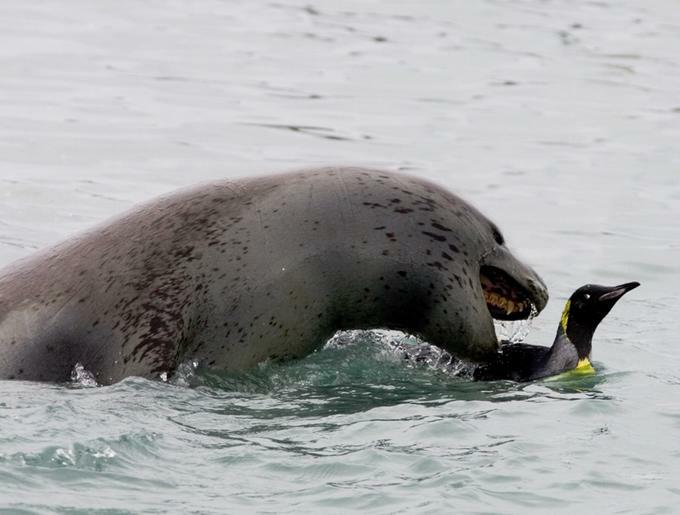 The female leopard seal weans and protects her leopard seal pup until the leopard seal pup is big enough and strong enough to be able to fend for itself. 0 Response to "Leopard Seal"